Elevate your monitor to a comfortable viewing height with single monitor mount (STAND-V001HG) from VIVO! 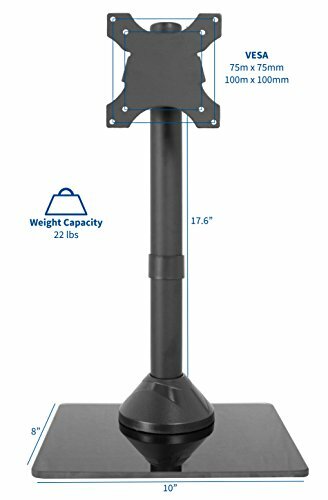 Constructed of high-grade steel, this stand was built to resist scratches and support a 13" to 32" monitor screen weighing up to 22 pounds. The sleek, black appearance blends well with virtually any environment, and the elegant glass base contributes a classy look while providing extra storage space. 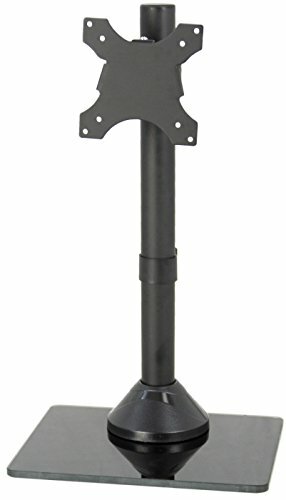 Featuring full articulation and height adjustment along the center pole for optimal viewing, removable VESA plates for easy mounting, and integrated cable management to keep cords clean and organized, this stand was built for workplace excellence. 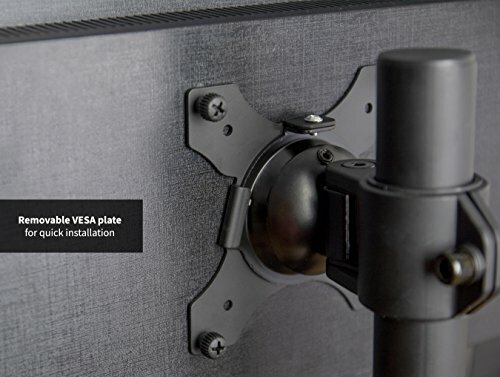 All of the necessary hardware and instructions are provided for fast and easy installation, so you can get your screen mounted and providing ideal viewing angles in no time! 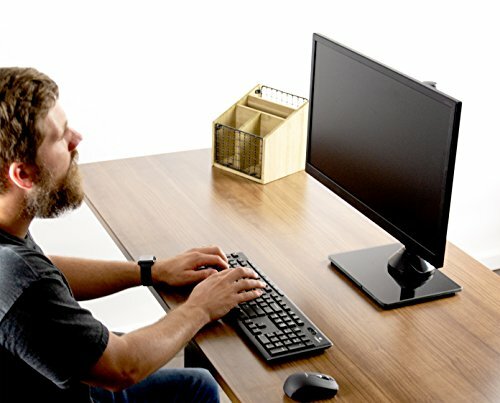 Supports one monitor screen 13" to 32"
Base Dimensions: 10" x 8"
ERGONOMIC VIEWING - Elevating your monitor to a comfortable viewing height reduces eye strain and encourages better posture for your neck and back while you work long hours at the office. 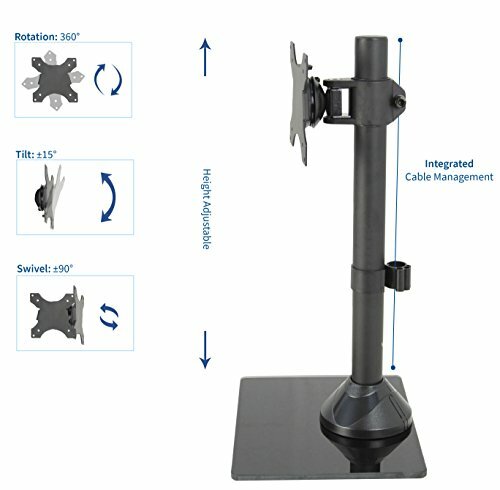 COMPATIBILITY - This single monitor free-standing mount fits most screens 13" to 32" in size and 22 pounds in weight with VESA 75x75mm and 100x100mm mounting holes. STURDY GLASS BASE - The solid 10" x 8" glass base with underside padding provides excellent support for your expensive equipment while creating additional desk space on its elegant surface. 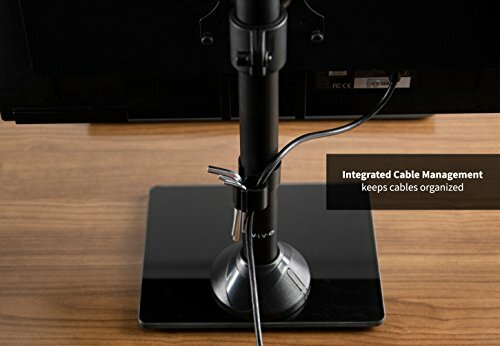 INTEGRATED CABLE MANAGEMENT - Keep your power and AV cords clean and organized with a detachable cable clip on the center pole.